When most people hear the word Brazil, they immediately envision themselves lying on a white-sand beach lapped by warm turquoise waters, while sipping a lime caipirinha. Indeed, Brazil’s 7,400 kilometers (4,600 miles) of stunningly varied coastline are sheer bliss for surfers and divers, not to mention dog paddlers and sun worshippers. Yet, Brazil is also home to the desert-like Sertão, lush coastal mountainscapes, the dense Amazon rainforest, and the Pantanal, a wetland ecosystem teeming with exotic flora and fauna. Just as varied as the country’s geography are Brazilians themselves. While the rest of South America was conquered by Spain, Brazil was colonized by Portugal, which explains the adoption of Portuguese as the national language as well as a predilection for grandiose baroque architecture and bolinhos de bacalhau (crunchy codfish balls). 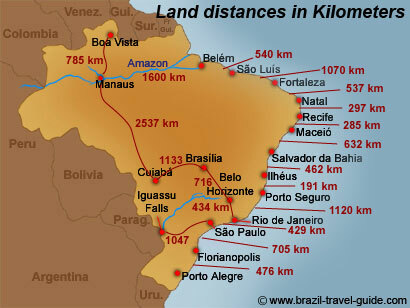 However, in northern Brazil, more than 20 percent of the Amazon is controlled by the region’s indigenous peoples. And in Bahia’s picturesque capital of Salvador, 85 percent of the population is of African descent, and numerous festivals are linked to the Afro-Brazilian Candomblé religion. Meanwhile, in São Paulo, large Italian, Japanese, and Lebanese immigrant communities mean that pizza, sushi, and kibes are as commonplace as feijoada, the succulent national stew of beans flavored with salted beef and pork. In Brazil the past and the future are constantly colliding. The gleaming modernist capital of Brasília coexists with the spectacular 12,000-year-old cave paintings in the hills surrounding the Amazonian river town of Monte Alegre. And there’s no escaping the glaring discrepancies between rich and poor. Just climb to the lush summits of Corcovado and gaze down at the luxury condos squeezed between beautiful beaches and Rio’s sprawling slums. Despite difficult economic and social circumstances, Brazilians are champions at the art of enjoying themselves. The Carnaval festival is merely one example. Festas (festivals) abound in Brazil and are almost always accompanied by the pulsating beat of samba, forró, chorinho, and maracatu. Rivaling Brazil’s musical richness is the contagious alegria (joyfulness) of its inhabitants. You’ll be hard-pressed to find a people that exhibit the good humor and warmth of Brazilians. Life flows to a different rhythm here and the alegria you’ll find will leave you wanting more. At once both a cinematic cityscape and a grimy urban front line, Rio de Janeiro, known as the cidade maravilhosa (marvelous city), is nothing if not exhilarating. Flanked by gorgeous mountains, white-sand beaches and verdant rainforests fronting deep blue sea, Rio occupies one of the most spectacular settings of any metropolis in the world. Tack on one of the sexiest populations on the planet and you have an intoxicating tropical cocktail that leaves visitors punch-drunk on paradise. With the seductive sounds of samba as their rallying cry, Rio’s residents, known as cariocas, have perfected the art of living well. From the world-famous beaches of Copacabana and Ipanema to the tops of scenic outlooks of Corcovado and Pão de Açúcar to the dance halls, bars and open-air cafes that proliferate the city, cariocas live for the moment without a care in the world. This idea of paradise has enchanted visitors for centuries, and there are dozens of ways to be seduced. You can surf great breaks off Prainha, hike through Tijuca’s rainforests, sail across Guanabára, dance the night away in Lapa or just people-watch on Ipanema Beach. While Rio has its share of serious problems, there are plenty of residents – expats included – who wouldn’t dream of relocating. It’s no coincidence Christo himself sits arms outstretched across the city, either. A total of 275 individual falls occupy an area more than 3km wide and 80m high, which makes them wider than Victoria, higher than Niagara and more beautiful than either. The falls are unequally shared between Brazil and Argentina, with Argentina claiming the majority. while the Parque Nacional Iguazú in Argentina provides an up-close and personal experience. Both are absolutely thrilling. Every traveler has fantasized about a trip to the Amazon. Just the name evokes images of dense rain forest, indigenous tribes, and abundant wildlife. The numbers are certainly mind-boggling: the Amazon basin is twice the size of India, and spans eight countries. At its height, the river can measure 40km across and dump 300 million liters of fresh water into the ocean per second. That’s more than the next eight largest rivers combined. Yet many travelers leave the Amazon underwhelmed, having come expecting a Discovery channel–like encounter with jaguars, anaconda and spear-toting Indians. That simply doesn’t happen – surprise, surprise – much less on the schedule or budget of most travelers. The Amazon’s quintessential experiences are more sublime than they are superlative: canoeing through a flooded forest, dozing in a hammock on a boat chugging upriver, waking up in the jungle to the call of a thousand birds or the otherworldly cry of howler monkeys. It’s only in the halogen glare of unreasonable expectations (or too short a visit) that a trip to the Amazon will feel disappointing. The river itself is massive and unrelenting, as much a living thing as the plants and animals that depend on it. Wildlife is hard to see, but that much more special when you do; the rain forest is everywhere and awesome. Indigenous tribes are extremely reclusive, but the Caboclo (mixed Indian and European) communities that populate the riverbanks are vital and compelling. On a river whose size is legendary, it’s actually the little things that make it special. Give it some time, forget your expectations, and the Amazon cannot fail to impress. The Pantanal has few people and no towns. Distances are so great and ground transport so poor that people get around in small airplanes and motorboats; 4WD travel is restricted by the seasons. The only road that runs deep into the Pantanal is the Transpantaneira. This raised dirt road sectioned by around 125 small wooden bridges ends 145km south of Poconé, at Porto Jofre. Two-thirds of the intended route from Poconé to Corumbá (at the border with Bolivia) has been left incomplete for lack of funds and particularly for ecological concerns. The city of Salvador and the region of Bahia are some of the most interesting highlights of Brazil. Here, a colorful, historic city is situated near miles of amazing beaches and coastline. Salvador da Bahia de Todos os Santos, as it was formally called by the Portuguese, is the old colonial capital of Brazil. Built on the peninsula that separates the bahia (bay) from the Atlantic Ocean, its colonial legacy and strong African influences give the city a distinct atmosphere. Salvador is divided into an upper and lower section (cidade alta and cidade baixa). The enormous Lacerda elevator goes from one level to the other and gives you great views over the city. Pelourinho, the old colonial part of the city, is part of the cidade alta. It is also the tourist epicenter of Salvador, and for good reason: most of the neighborhood is a pedestrian district, with cobblestone streets, many churches, and brightly-painted buildings. Take your time walking around to discover the shops, restaurants, bars, and other attractions. But note: although Pelourinho is very well guarded by police night and day, you should take care in some of the neighbouring areas after dark (especially the area to the right of Praça da Sé as one enters the praça, and to right of Terreiro de Jesus as one enters from Praça da Sé). São Paulo overwhelms the senses with its sheer size. With over 10 million inhabitants, it is the world's third largest city and the largest in South America. São Paulo and its rival Brazilian city, Rio de Janeiro, have often been compared to New York and Los Angeles respectively. If Rio has gained fame for its striking natural setting, São Paulo's attraction lies in its people and its vibrant cultures. The Avenida Paulista's canyon of upthrusting skyscrapers only hints at the city's sources of energy. A more cosmopolitan city than its counterpart, São Paulo possesses significant ethnic minority communities, including substantial Japanese, Italian, and Arab and Lebanese Christian neighbourhoods. The array of nationalities living in São Paulo have made it a legendary city among gourmands: Japanese, Italian nuova cucina, Brazilian, Chinese, Jewish, and Arab restaurants are all familiar parts of the city's landscape. Brazil's famously good beef is put to good use at the numerous rodizios and churrascarias. Succulent, roasted cuts of meat are circulated around the tables and cut to patrons' order. In fact, people often visit São Paulo just to dine out. The Jardins district is the center of the dining scene, and thus the center of the São Paulo social scene. Paulistanos eat late--restaurants often don't begin serving until 9pm or 10pm, and it is common for them to stay open until 3am. Brazil's most modern, cosmopolitan city has much to offer in addition to its outstanding cuisines. Its museums are among the finest in South America, its surrounding coastline is graced with many lovely beaches, and its entertainment and nightlife have for years attracted some of the best performers in the world. For centuries, civilization did not portrude into Brazil far from the coastline. The vast majority of the population was there, trade was there, cities were there. It has always been a dream of the Brazilian government to move the capital inland - thereby gaining more control of the vast interior of the country. This dream did not become reality until the 1950's, when Brazilian president Kubitchek decided Brazil needed a monumental capital if it was ever to become a world power. As America had Washington DC, Australia had Canberra and Russia had once had St. Petersburg, so too would Brazil have its Brasilia. Brasilia is the result of a modern urban project designed by Lúcio Costa. If seen from above, the city's pilot plan resembles the shape of an airplane; some people consider that it looks like a bird with open wings. The architect, Lúcio Costa's original urban concept arranged the city in the shape of a cross, to symbolize possession. He planned the city around large avenues which divided it into sectors. Recife is the capital of the state of Pernambuco in Brazil. It is one of the oldest settlements in Brazil, dating from 1535. Recife is one of the largest cities in Brazil, it is also where the Beberibe River meets the Capibaribe River to flow into the Atlantic Ocean. It is a major port on the Atlantic Ocean. It's the 9th city by population, with over 1,500,000 inhabitants. Recife was no more than a fishing village when Dutch troops occupied Pernambuco (and later most of the Brazilian Northeast) in 1630 and moved the capital there from nearby Olinda. The Dutch developed Recife, building bridges and palaces and called it Mauritsstad, or Maurice Town, after the prince of Orange who was governor-general of the Dutch territories in Brazil. From the Dutch period, the oldest synagogue in the New World can be found in the old quarters of Recife Antigo. The Portuguese reconquered Pernambuco in 1654. The best beaches, with year-around warm water, are found in Boa Viagem, one of the most famous urban beaches in Brazil, visitors get enchanted by the sandy beaches with warm green waters and also by the complete infrastructure of hotels, restaurants, good nightlife and services which surrounds it. The word "recife" means reef in Portuguese. A reef barrier is present very close to shore, and sometimes touching it. Shark attacks have become a more frequent danger since the 1990s, so it is illegal to surf or to swim beyond the reef line or in exposed stretches of beach. Fortaleza beaches attract visitors due to their beauty and great nightlife. Praia do Futuro, a few miles from the downtown area, is one of the best known beaches in Brazil. Fortaleza is also a great hub to wonderful Ceará beaches of which Morro Branco and Canoa Quebrada are good examples. Fortaleza has over 2 million inhabitants. Big city life came with a price for central beaches such as Meireles and Iracema, which don't rank well in terms of water quality - but are good for partying at. Fernando de Noronha is a Brazilian volcanic archipelago, within the Pernambuco state. It is located on the Atlantic Ocean, at 545 km (338 mi) from Recife (Pernambuco), 710 km (441 mi) from Fortaleza (capital city of Ceará) and 360 km (223 mi) from Natal (capital city of Rio Grande do Norte). The archipelago is 26 sq. km (10 sq. mi) and consists of 21 islands; only the biggest island (also named Fernando de Noronha) is inhabited. The other islands were declared Sea National Park by the Brazilian government; therefore, human settlement is prohibited there, except for scientific research purposes. It is located at 3° 50' S, 32° 24' W.
Amerigo Vespucci discovered the archipelago on August 10th 1503. The tourist infrastructure is quite basic: homestay-like accommodation –usually without hot water-, a few restaurants, and strict rules regarding the conservation of the place. However, tourists going to Noronha (as it is usually called) do not look for night centers or big hotels, but rather they are determined to have few comforts provided that they are able to enjoy the wonderful nature of the archipelago, comparable to diving in the Caribbean Sea and the Maldives Islands. The "Instituto Brasileiro do Meio Ambiente" -Brazilian Agency for Environmental Protection- (Ibama) closely controls that the rules established in the archipelago for the conservation of the ecosystem are observed. You should take into account some rules regulating tourism when planning your trip. The first rule consists in that only 500 tourists are allowed to enter into the island per day. Furthermore, there are entrance and staying fees. The Environmental Protection Fee increases progressively day after day. When planning certain activities, you have to consult the local authorities since swimming is prohibited or restrained in some beaches (they constitute the place where turtles spawn) and some diving areas have limitations in order to preserve corals. We would like to thank the Brazil Tourism Board for the information and pictures provided. There are two sides to Florianópolis. On the mainland, the industrial zone occupies the districts of Estreito and Coqueiros. Across the bay, the island holds the historic center and the chic district of Beira-Mar Norte. Two picturesque bridges link these halves. The old suspension bridge, the Ponte Hercílio Luz, is no longer open to traffic, but it still lights the night sky, acting as the defining feature of Floripa’s spectacular skyline. Florianópolis is a convenient transportation hub, with all of the island’s 42 beaches within an hour’s drive. While in the center, travelers can explore the colonial, cobblestone streets that fan out from the recently renovated Praça XV de Novembro, or take a sunset stroll along the embankment in Beira-Mar Norte.